The continuing evolution of higher education in Central Oregon is taking another major step forward as renovations gather pace at the new Oregon State University-Cascades Graduate & Research Center on Columbia Street in Bend. Passers-by along the busy thoroughfare of Colorado Avenue, paralleling the Deschutes River on the City’s west side, will have seen fresh monument signage recently unveiled officially signaling the institution’s arrival, as staff and administrators busily unpack boxes in readiness for an influx of students later this year. 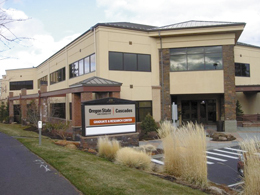 The move marks something of a departure for OSU-Cascades, as the recent acquisition of the property represents the first building it owns outright in the region and a more independent presence away from shared space at the Central Oregon Community College campus at the city’s western edge. The building, spanning approximately 30,000 square feet and located at 650 SW Columbia St. in Bend, was purchased using $2 million in lottery bonds approved by the Oregon State Legislature and $1 million contributed by OSU-Cascades, plus $800,000 in additional private support from former Bend Mayor Allan Bruckner. Remodeling of around 10,000 square feet of the former office space to incorporate classroom and learning spaces, budgeted at around $630,000, is also underway, and expected to be complete this summer. Bend Research will lease a portion of the building’s space where it hopes to spur future public/private research collaborations. The Governor’s Regional Solutions Center – incorporating regional representatives from the Governor’s Office, Transportation, Land Conservation & Development, Housing & Community Services, Business Development and Environmental Quality departments – will lease another 1,000 square feet and AT&T will continue its current lease of 6,000 square feet. “This new building allows us to move many of our graduate programs and will accelerate the evolution of OSU-Cascades into a comprehensive university,” said Becky Johnson, vice president for OSU-Cascades. The building will house OSU-Cascades administrative staff, its graduate teaching and counseling programs, and future programs such as the proposed master in public health and master of fine arts in creative writing. The full purchase price of the building was $3.88 million and the acquisition also allows OSU-Cascades to save $225,000 annually through a reduction in lease fees on the COCC campus and through rent revenues at the new facility. The rapidly growing campus had an enrollment last fall of approximately 750 junior, senior and graduate students – an increase of 10 percent in headcount, and 16 percent in FTE, over last fall. House Bill 3627, which provided the legislative support for the new property acquisition from lottery bonds earmarked for economic development, was introduced by Rep. Jason Conger (R-Bend) and sponsored by Sen. Chris Telfer (R-Bend) and Reps. Gene Whisnant (R-Sunriver), Mike McLane (R-Powell Butte) and John Huffman (R-The Dalles). Senator Telfer reports that she is in the process of working with OSU and OSU-Cascades on solutions to finance the purchase of additional buildings in an effort to continue the campus expansion. This would have a significant impact to Central Oregon, Oregon’s economy, and further the vision for improving education in our state at a fraction of the cost for other expansion options Telfer pointed out. “Rather than borrow $16 million in lottery funds, I’ve suggested we make use of a fraction of the $660 million we know the state has, leaving the lottery dollars for other state needs,” explained Telfer. The $16 million in state support would be supplemented by private donations and borrowing to support the anticipated cost of expanding the campus to support 4-year programs. “We are extremely grateful to Representative Conger for championing this effort, and to Senator Chris Telfer and Representatives Gene Whisnant, Mike McLane and John Huffman for their dedicated support,” added Johnson. “Almost everyone agrees that the number one priority for a strong community is an educated populace,” said former Bend Mayor Bruckner. “Bend has a fine public school system, a well-established and outstanding community college, and an emerging university that deserves and needs greater support. Administrators and backers agree the next step is to continue the growth of the institution and develop support for degree programs, student scholarships and faculty endowments, including following the lead shown by such as BendBroadband founder Donald Tykeson, who recently gave $250,000 to establish the campus’s first endowed faculty position, in energy engineering management. OSU-Cascades was born more than a decade ago of a grassroots effort put forth by Central Oregonians to bring a university to the region. In 2000, the Oregon University System selected OSU, the state’s land grant university, to administer a campus that would serve as a capstone to Central Oregon Community College, offering upper-division and graduate coursework toward bachelor’s and master’s degrees. The new university opened its doors in September 2001. Today, the dynamic campus offers degree programs in disciplines essential to the world’s growing demand for sustainable enterprises in energy, natural resources, health and recreation and tourism. The living-learning laboratory of Central Oregon, combined with the world-class excellence of OSU’s faculty, provides an incubator for student opportunities and experiences shaped by OSU’s strengths in engineering, science, business and the humanities. The vibrant campus continues to develop, bringing a Central Oregon orientation to OSU’s strategic emphases on healthy people, a healthy planet and a healthy economy. Purpose: Graduate & Research Center will house OSU-Cascades administrative staff, and graduate teaching and counseling programs. The Governor’s Regional Solutions Center will lease 1,000 square feet. Bend Research will lease a portion of the space to potentially spur public/private research collaborations. AT&T will continue its lease of 6,000 square feet. • Energy Engineering Management (BS) (Launched Fall 2011). Grew from 4 to 24 students by Fall 2012. By Winter 2012, 44 Pre-EEM (at COCC and OSU-Cascades) and EEM students, plus 10 Pre-EEM students in Corvallis. • Exercise and Sports Science (BS). (Fall 2011) – launched with eight students. By Winter 2012, 25 students had declared EXSS as a major. • Sustainability (BS) – double degree (approved March 2012; launch Fall 2012). • Courses (one per term in executive format) towards Graduate Certificate in Public Health (approved March 2012; launch Fall 2012). Approval to offer courses only, rather than full certificate program. • Master’s of Arts in Teaching (MAT) Secondary extension – math and science endorsement (approved April 2012; tentative launch in April 2012). For those wanting a jumpstart on MAT–Advanced Mathematics, and MAT–Integrated Science, the application deadline for the 2012-2013 cohort is April 20. Interested applicants are encouraged to contact Dr. Carolyn Platt at 541-322-3120, or via email: carolyn.platt@osucascades.edu. • Master’s in Fine Arts (MFA) – Creative Writing – (administrators hope for Spring 2012 approval and Spring or Fall 2013 launch) Social Science (BA/BS). • Computer Science – web and mobile software. On the evolving mix of degree offerings, OSU-Cascades Director of Communications & Outreach Christine Coffin said, “The bottom line is that to continue to attract students from both inside and outside the region we need a wide selection of degree programs that also have some uniqueness to the area. “For example, the Tourism and Outdoor Leadership program is an excellent fit with Central Oregon values and our economic development and is appealing to people both locally and from farther afield. Also, our innovative hospitality tuition ties into that same theme. As a practical illustration of how such collaboration hones the competitive educational edge, Coffin said that conversations with local companies that use programmers and need employees with hi-tech knowledge helped shape a computer science degree currently in design phase to be geared towards web and mobile software applications. Coffin added, “When we talk about degree programs, we also need to be realistic about timeframe expectations. “Typically, our Dean of Academic Programs works closely with stakeholders in series of meetings and informal surveys to identify areas of interest. “The establishment of a facility owned by OSU-Cascades is an important step in the growth, strength and permanence of this local institution,” commented Conger. “The building as envisioned will create significant synergies between OSU and Bend Research, as well as significant economic development opportunities for Central Oregon.